Skiers and snowboarders, the golden rule is Stay in Control! 1. What is the Mountain Code of Conduct? For everyone’s safety, including yours, skiers must be respectful towards others and obey the Mountain Code of Conduct, as well as any other ski area rules, regulations and sanctions in effect. Patrollers may intervene and confiscate a lift ticket should the Mountain Code of Conduct not be respected. 1. The Golden Rule: Control! Keep your speed in check, and always control your direction. Make sure you can stop and avoid any person or obstacle at all times. 2. Yield to Anyone Downhill of You! Yield to persons downhill, and choose a course that ensures their safety. 3. Free Up the Trail! Only stop if you can be seen from above, and never obstruct the trail. 4. At Intersections, Yield to Persons Uphill! Yield to skiers and riders uphill of you when entering a trail, or at intersections. 5. Help The Ski Patrol! If you’re involved in or witness an accident, remain at the scene and identify yourself to a first-aider. 6. No To Runaway Gear! Always use and wear the appropriate device to prevent runaway equipment. 7. No Drugs, No Alcohol! Do not use the lifts or trails when under the influence of drugs or alcohol. Obey all signs and warnings, and never venture off the trail or onto a closed trail. Be Careful On The Lifts! Ask the lift attendant for help if you’re not familiar with how it operates. Obey all signs posted on lift towers. For more information, upload the Mountain Code of Conduct and watch this video (french only). 1. 1. Where should you stop on a ski trail? 2. What is a snow brake device? a) Special outerwear with an integrated locator device in case of avalanche. b) A device integrated into the base of your skis to improve slide performance. c) A device that PREVENTS your skis or snowboard from taking off if you fall. 3. You can ski off trail anywhere you find a wooded area and powder snow. 4. In Québec, inverted jumps (front flips/back flips) are prohibited..
5. How often should you have your binding DIN adjusted by a qualified professional? 1. A. It is essential to stop in a safe place on the side of the hill, in sight of skiers and skiers higher than you. 2. C. For skiers, a snow brake device is built into your bindings. On a snowboard, riders must wear a leash at all times. 4. True. Inverted jumps are prohibited in snowparks and on ski trails. Only persons training with professional coaches in designated areas may try these risky maneuvers. 5. B. So you won’t forget to have your bindings adjusted at the beginning of the season, the rule of thumb is to slide your DIN back to zero at the end of the season. You’re not only extending the lifespan of your springs, you’re also sure to remember to have your DIN adjusted before you hop on your skis, at the beginning of the next ski season. 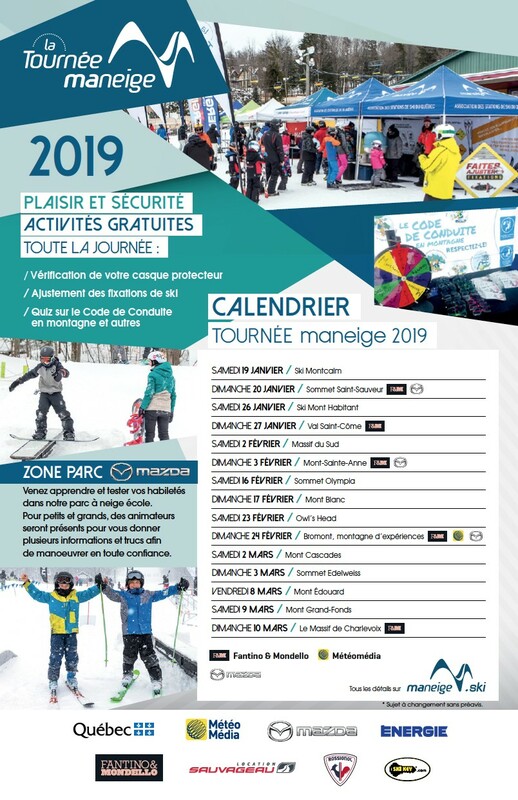 Visit Tournée maneige in the ski areas listed below to know more about the 1001 ways to have fun on the hills this winter! Note that dates are subject to change without notice.